Donald R. Bullock, 86, of Peotone, died Saturday, September 29, 2018, at The Cottages of New Lenox. Born August 17, 1932, in Albion, he was a Korean War Army veteran, 1st Calvary Division. He retired from Ford Motor Co. Stamping Plant as an inspector after 30 years of dedicated employment. 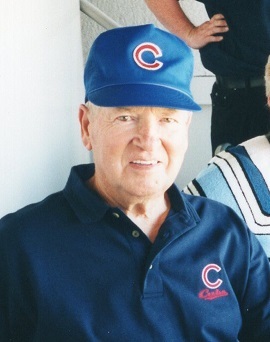 He enjoyed fishing, hunting, woodworking, and watching Cubs games. He loved spending time with his family and grandchildren and calling bingo at the Peotone American Legion. He always found time to visit with his co-workers from Ford at Coffee Time. Mr. Bullock is survived by two daughters, Debbie (David) Smit and Cindy (Gary) Fowler; grandchildren, Terina (Al) Taylor, Douglas (Kristen) Smit, Tabatha (Adam) Gordon, Dawn (Jim) Barrett and Michelle (Zach) Montpetit; great-grandchildren, Zackary, Avery, Jacob, Raegan, Keegan, Kaleb, Jared, Josephine, Sophia, Isabella and Camden; and a brother-in-law, Edwin (Janet) Shreffler. He was preceded in death by his wife, Genevieve L. Shreffler Bullock; his parents, Raymond and Nora Walters Bullock; four brothers, Deon “Johnny” Bullock, Ira “Preston” Bullock, Dewey “Max” Bullock and Royce Bullock; and a sister, Mary Etta Wood. Visitation 11:30 a.m. until the hour of services at 12:30 p.m. Saturday, October 6, at Kurtz Memorial Chapel in New Lenox. Private burial at Abraham Lincoln National Cemetery in Elwood. In lieu of flowers, memorials to the Parkinson’s Foundation, www.parkinson.org would be appreciated. For information, visit www.kurtzmemorialchapel.com or 815-485-3700.